Bonnie Brae Cleaners offers special cleaning services for your hard-to-clean clothing. Do you have a leather, suede or fur coat that needs special care? Our dry cleaning professionals are trained in the care for difficult materials that many dry cleaners are unequipped to handle. We know you will be impressed with the end result! Suede and leather are often two of the most difficult materials to clean. Both suede and leather have very special ways to cure the material. Improper laundering can remove these products, thus losing the original quality of the garment. 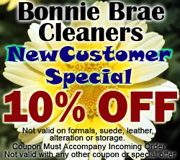 Bonnie Brae Cleaners provides cleaning services for many forms of suede and leather, such as jackets, coats, pants, skirts, and hand bags. Our special suede and leather cleaning professionals will restore your items to a like-new condition! Bonnie Brae Cleaners uses professionals who specialize in the cleaning of fur items. Be sure to clean your fur items regularly to keep them lustrous and beautiful. Come visit us today to have your special care items cleaned properly!